Try using a different browser entirely. Perform a complete browser refresh/reset (for example using Firefox instructions here). This will reset the browser to factory settings and users may not want to do this if they use add-ons on their browser as they may lose stored passwords and data. LibrarySearch+ allows you to search for electronic content within the majority of the ejournals, newspapers and databases available to the University of Cambridge digitally. You can perform general keyword searches for an overview of a subject or find a specific article via a title search. To search for printed material please use LibrarySearch (LibrarySearch will also provide holdings information for journal titles that are available electronically). The initial search screen allows you to choose between an ‘article’ search or an ‘everything’ search. The ‘article’ search will offer results for journal articles only (the ‘content type’ ‘journal article’ box will be checked by LibrarySearch+ on the left hand side of the results screen) whereas the ‘everything’ search will include results for newspaper articles, book chapters and book reviews, amongst other things. If you would only like to see items that offer full text access online then make sure you check the ‘items with full text online’ box which can be found under the heading ‘Refine your search’ on the left hand side of the results screen. LibrarySearch+ will include citation or abstract only results in any search where you do not specify full text is required. By clicking ‘more …’ under the headings ‘Content Type‘ or ‘Subject Terms’ you will see a pop-up box which gives you the option to filter your search results by excluding or including different content. 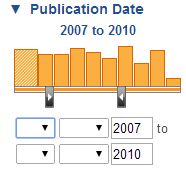 You can also filter your results by date of publication. Simply enter a date range into the boxes or move the arrows along the bar to amend the date range. out as many details as possible to perform this search for an article. You cannot perform a DOI search via the basic or advanced search options on LibrarySearch+. 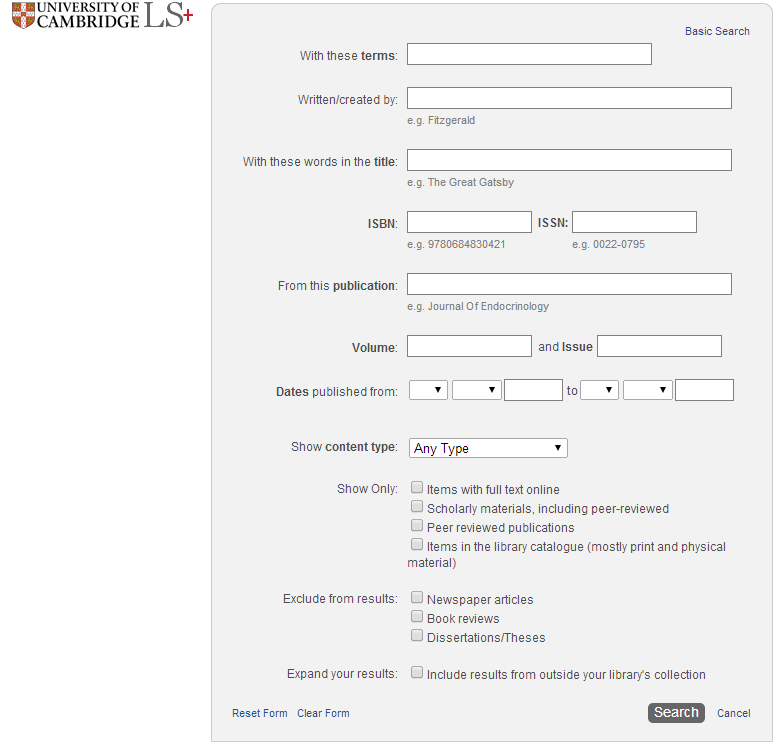 If you need to find an article by it’s DOI then please use the ‘Search Articles by citation (DOI & PMID)’ option available on the ejournals@cambridge A-Z page. This screen should take you though to full text via the Raven login, if you are off campus. If there is a problem with the way the page has loaded you can choose to ‘Open content in a new tab’ This can give access to full text when the page is taking too long to load or you see a blank screen at this stage. 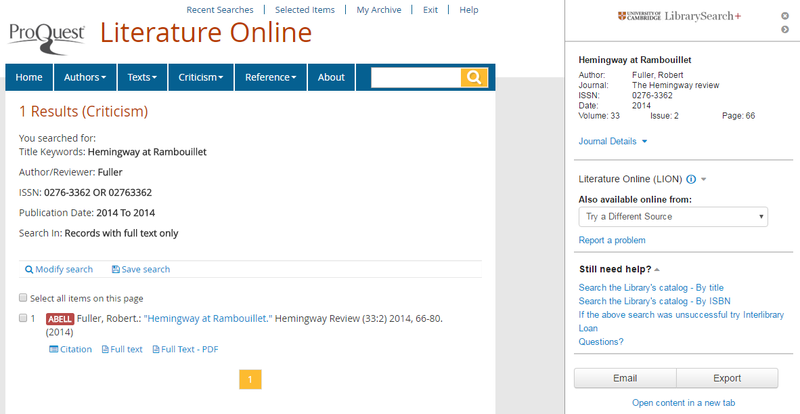 If you have clicked on a link to a citation or abstract you will see a screen telling you that you cannot access full text content you can use the sidebar to contact the ejournals@camrbidge team (Report a problem), check LibrarySearch for print holdings of the journal or to request the journal via Inter-Library Loan. For a guide to troubleshooting common ejournal error messages then please see this blog post. If you are unable to get the full text via LibrarySearch+ for an article that we should have access please search for the title via the ejournals A-Z.